The castle complex on the Willibaldsberg was begun in 1355 and extended in the second half of the 16th century under Martin von Schaumberg. It was transformed into an impressive residence by Elias Holl during the reign of Prince-Bishop Johann Conrad von Gemmingen (1595-1612) – at this stage of the building's history the towers were crowned by onion domes. Gemmingen also laid out the renowned botanical garden "Hortus Eystettensis". Based on the copperplate engravings illustrating the plant collection which were created in 1613 by Basilius Besler, the Bastion Garden opened in 1998 reproduces the plant world of the original botanical garden. 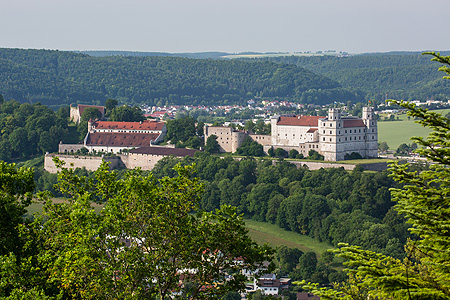 The Jura Museum (Branch of the Bavarian State Scientific Collections) at Willibaldsburg Castle is temporarily closed.